Element Disc packages advanced technology into a minimal light engine to deliver 330 lumens while using only 7 watts of power. With a CRI of 80 and a CCT of 3000K, Disc provides brilliant, uniform light for up to 50,000 hours - or the equivalent of 25 years in an average work environment. And with a clever folding mechanism, Disc is as convenient as it is beautiful. Through the use of revolutionary Thin Film LED Technology, Element Disc produces a consistent ultra-wide light footprint. This new technology not only provides ample amounts of bright 3000K light that helps reduce eye strain, but also increases the lamp’s usable life. Element Disc’s smart dimming feature provides seven adjustable illumination levels for energy-efficiency and ergonomic function. Intelligent and intuitive, Element Disc features an built-in PIR occupancy sensor that automatically turns the unit off when the user is not in the area. Disc’s internal counterbalance system provides effortless, one-touch positioning and it folds away into a compact nesting position for easy storage. 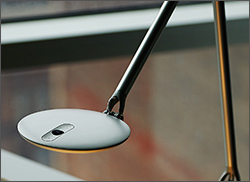 Available in one of 20 mounting options to suit any work environment, Element Disc is an incredibly versatile adjustable LED desk lamp. Created in the Humanscale Design Studio, Element Disc was designed for maximum adjustability in a reduced light engine package. 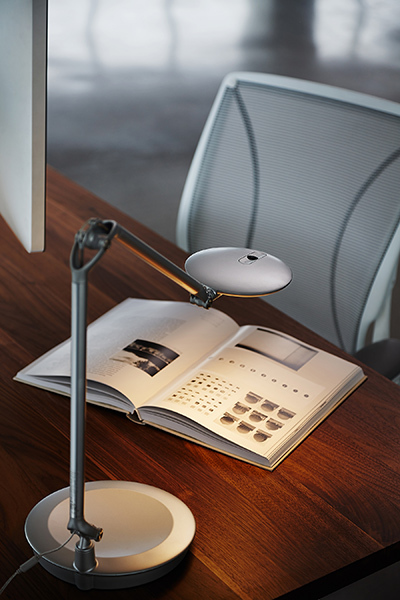 Disc delivers an unparalleled ergonomic lighting solutio by providing efficient high light levels in a functional, minimal design.